I found wearing my daughter in a carrier for dog walks much more satisfying for both of us than pushing her in the stroller, so I started wearing her on our walks. I experienced some delayed PPD when I stopped nursing earlier than I wanted to, and our babywearing dog walks really helped me get through that difficult time – allowing me to bond with Ainsley and be close to her after a long day of work. Rachel and Darlene! Without their introducing me to this world, I’m not sure I would have discovered post-Moby/Bjorn babywearing at all. I am forever grateful! If I was forced to pick one, probably ring slings. I love that they are so quick and easy, and they’re just as good for a newborn as they are for a toddler. They are also among the more affordable carrier types. Oh, man! For beauty and memories, my Girasol Snow Flame wrap conversion ring sling. I don’t love the shoulder style these days, but apart from my original wrap purchase, that was the carrier that really made me feel like I was committing to this whole babywearing thing. It’s shared a lot of snuggles, and I can’t wait to use it with baby #2. Probably the standard size Bamberoo SSC. I love that thing! I find it super comfortable even with my big toddler. Bamberoo can be hard to find since they are made on a smaller scale, so I love that the library has one I can borrow.After that, I’d say our herringbone weave Inda Jani wrap conversion ring slings (we have 2 orange ones and one rainbow one). I have one of these personally, and they are one of my favorite rs to recommend because they are great for even heavy toddlers and are also very affordable. It has helped me deal with depression. It’s helped me deal with needing to spend time with my child while being a full time working mom. It’s also helped me find a great way to give back to the community and help others, so I can get all the “warm fuzzies” I need emotionally and that I don’t get from my full time job. One time I got called “supermom” by the cashier at Chick-fil-a, when I was wearing my 2 year old in a ring sling and didn’t need help carrying my tray of food to our table! Ring sling! I can wrap pretty quick, but I don’t have time to wrap if there’s a zombie chasing me. I can get kiddo in a RS “good enough” to get going and fix the seat as we run for our lives! I really like helping out friends! 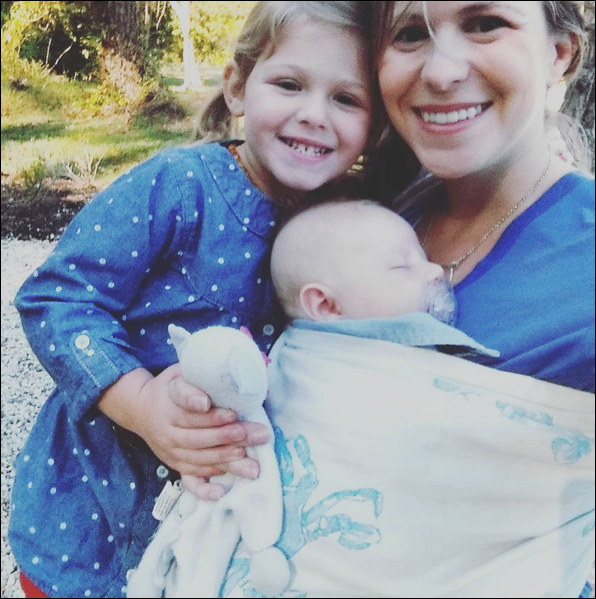 It’s rewarding to see people I know from outside of babywearing fall in love with it, too.Is there anything babywearing related you are still learning or looking forward to improving? Since I started a bit “late” with Ainsley, I am excited to get more familiar with newborn wrapping with baby #2! I also never nursed in a carrier, since I started babywearing more seriously after we stopped nursing, so I am totally geeky excited about trying that out. I love writing, and have a blog that I don’t really keep up anymore but would like to. I also enjoy doing novice web design, graphic design, and social media. I’ve danced for most of my life (tap, jazz, ballet, etc), and enjoy keeping up with that as time and family allows. 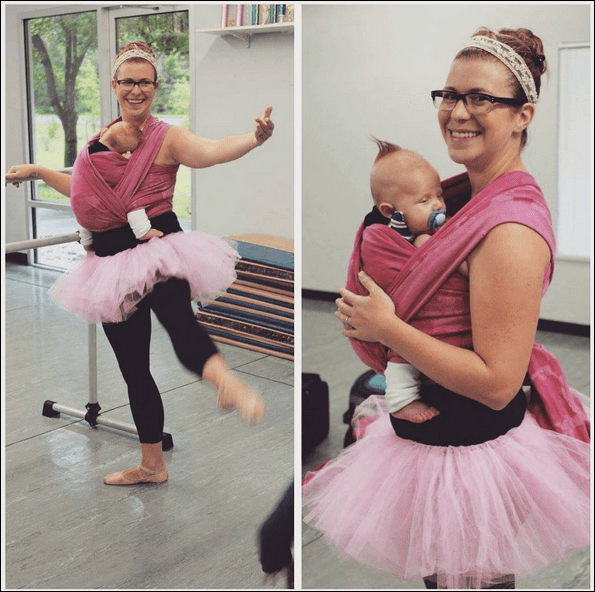 I love organizing our babywearing ballerinas classes, because it combines 2 of my passions! I am terrible at riding a bike, because I never really did it as a child. I can do it…sort of…but it’s white knuckles all the way and I may crash land if something scary happens. And though I am an avid dancer, I can’t do a cartwheel! I hate onions and cilantro. Thanks to Jennah for sharing. 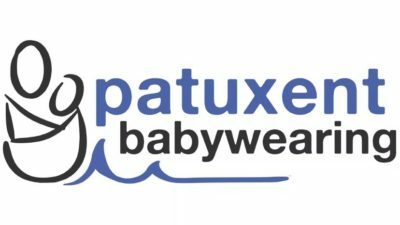 If you want more information on how to become a volunteer for Patuxent Babywearing, please let us know!